"For material creation, Lord Krsna's plenary expansion assumes three Visnus. The first one, Maha-Visnu, creates the total material energy, known as the mahattattva. The second, Garbhodakasavi Visnu, enters into all the universes to create diversities in each of them. The third, Ksirodakasayi Visnu, is diffused as the all-pervading Supersoul in all the universes and is known as Paramatma. He is present even within the atoms. Anyone who knows these three Visnus can be liberated from material entanglement." 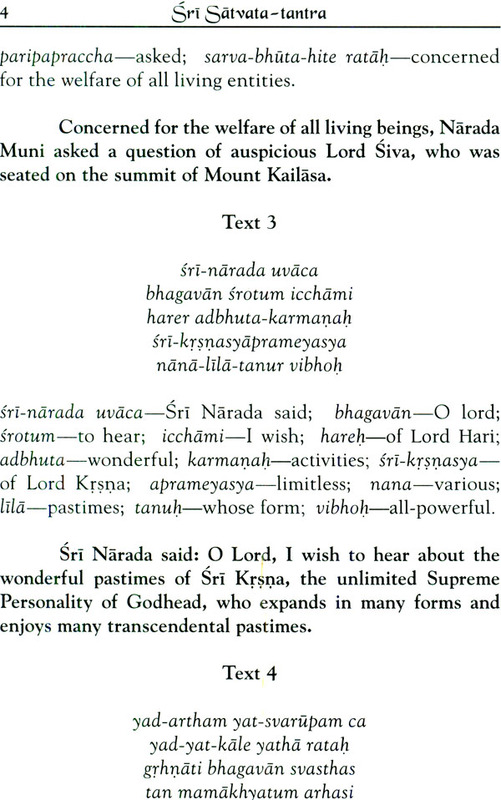 In this tantra Narada Muni asks questions of Lord Siva as he was seated on the summit of Mount Kailasa and deals extensively with the incarnation of SrI Krsna. The first section describes the creation of the cosmic manifestation and thus deals with the three Visnu incarnations. The next section deals with the Lord's pastime incarnations and the Lord's appearance in each of the manvvantaras. In this section Lord Rania's pastimes are first highlighted, and then Lord Krsna and Lord Balarama's pastimes are delineated, one after another, in future tense, indicating that this literature was composed before the advent of Lord Krsna. The next section explains how the incarnations of the Lord are in three categories: full (purna), partial (amsa), or sub-partial (kala). Then sixty-four qualities of the Supreme Personality of Godhead are described. The next section describes different kinds of devotional service, which are called jnana devotional service, kriya devotional service, and lila devotional service. In this section the stages of devotional service, culminating in love of God, are delineated, and the six stages of surrender to the Lord are explained. 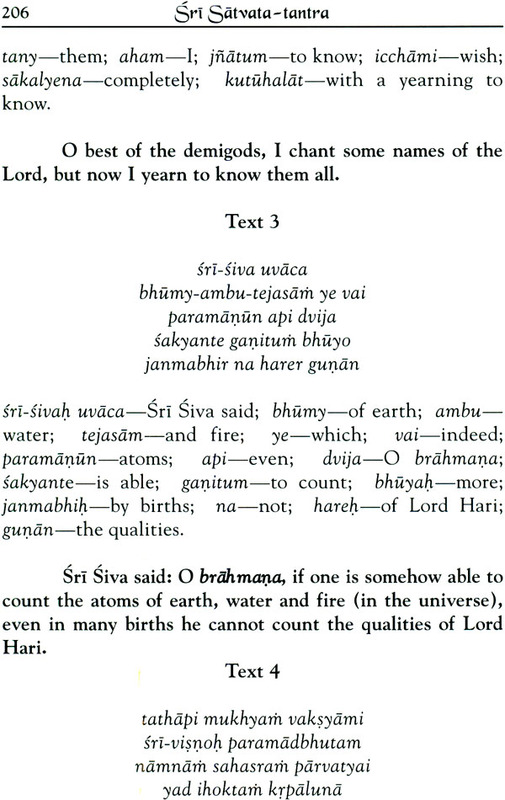 Here there is a very nice description of the qualities of a pure devotee of the Lord. Here the three types of devotees (neophyte, intermediate, and advanced) are described. 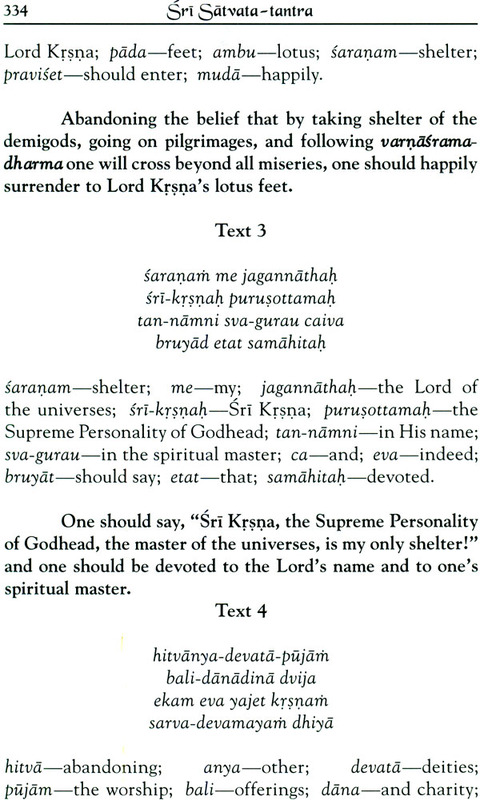 The next section describes the four yuga-dharmas, and it is nicely explained that in the age of Kali, only the chanting of the holy names of the Lord is effective. 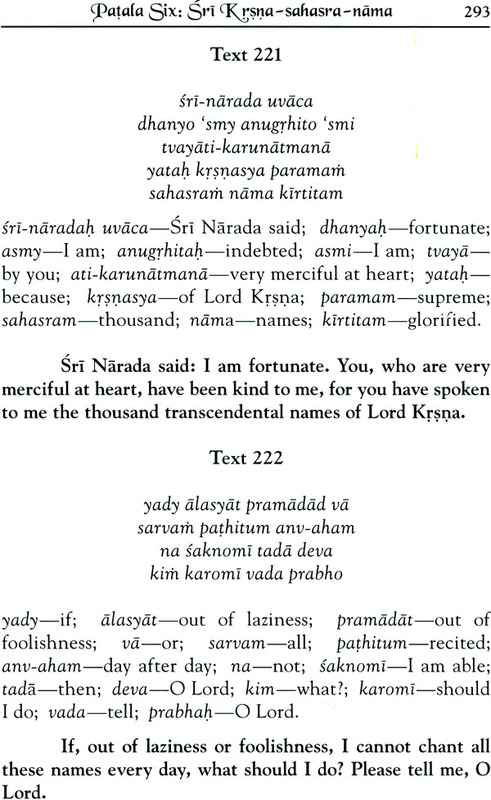 The next section lists the thousand names of Lord Krsna and describes the glories of the recitation of these names. The next section describes the offenses to be avoided while rendering devotional service and while chanting the holy names of the Lord. 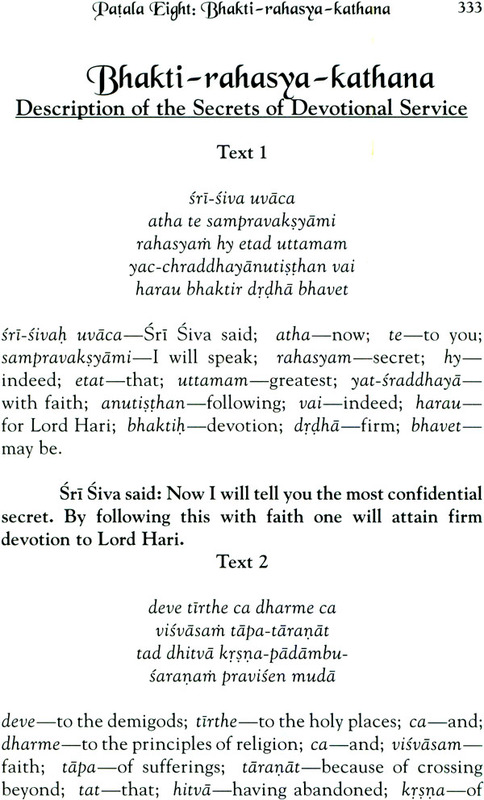 The next section provides some confidential instructions regarding devotional service and the final section explains why the Vedas prescribe animal sacrifices. The work concludes with a recap of the subjects covered. 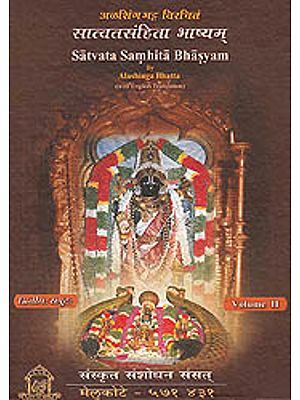 This is a very wonderful book that concisely guides the devotee on the path of advancement in devotional service, and it has been so nicely translated by Kusakratha Prabhu. It was a great pleasure for me to very carefully read it and I am confident that you will feel the same.